We're here to help, naturally. Flavourless. FOS fibres. Natural bacteria. Suitable in pregnancy. Gluten free. Yeast free. No added sugars. No artificial colours. 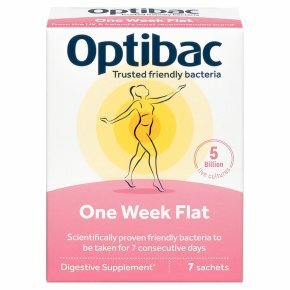 Suitable for vegetarians.Your short-term course of live cultures, such as L. casei Rosell-215, to be taken for 7 consecutive days These four high quality strains from OptiBac Probiotics have been tested and shown to survive stomach acidity. Each sachet provides 5 billion live cultures (5 x 10 9) + 0.3g FOS fibres. Recommended use Adults and children (4 years and over) take one sachet daily for seven consecutive days, or as professionally directed. Shake sachet, slowly sprinkle contents into a glass of water and vigorously swirl to dissolve fully. Take with food, preferably with breakfast. Can be taken monthly, or on an ongoing basis. This natural option does not interfere with medicines or supplements for bloating. Those with serious medical conditions should consult a doctor before use. Do not exceed recommended daily dosage. Food supplements should not be used as a substitute for a healthy diet and lifestyle.